I am so pleased you are here. I am thrilled to be included in a gorgeous round-up of Fall Tours hosted by The White Buffalo Styling Co. If you haven't seen all of the tours, I would suggest starting here and clicking all the way through. They are amazing! Welcome to those here from the talented The Chronicles of Home. This is our home, Eleven Gables. Since the Fall season is just barely showing its face, I am starting the season off a little softer. As the leaves change, I will add in orange pumpkins around the landscape. You might even see a playful little ghost or two as the children get ready to trick-or-treat the neighborhood in their festive costumes. 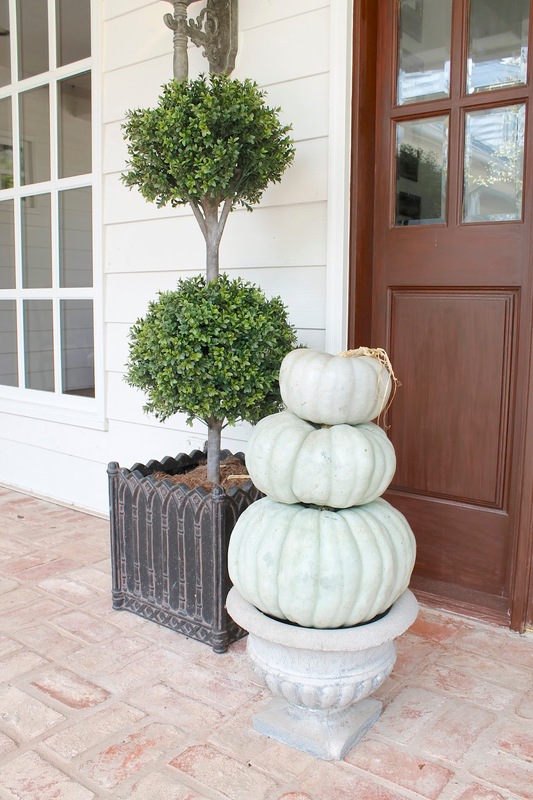 Faux boxwood topiaries flank the stained doors and the palest green, monotone Cinderella pumpkins stacked up make a fun little fall statement. The mudroom entrance got a little pop of color on the door and another cinderella pumpkin. 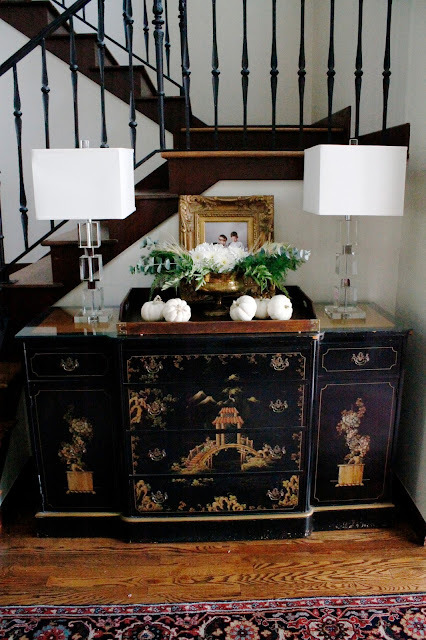 Just inside the front door is a black chinoiserie buffet that I found off craigslist this summer! I topped it with a simple arrangement and fresh white pumpkins. In the kitchen, I placed white pumpkins in brown transferware dishes along the window sill. Can you feel that cool breeze blowing in? Cinderella pumpkins and grocery store flowers bring in a few touches of fall-like weather. 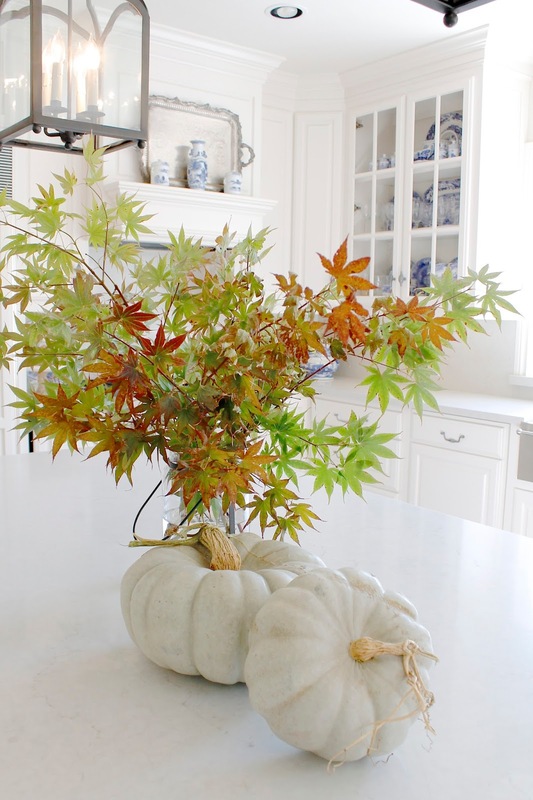 Leaves from our Japanese Maple tree add a fall punch of color to my otherwise white kitchen. 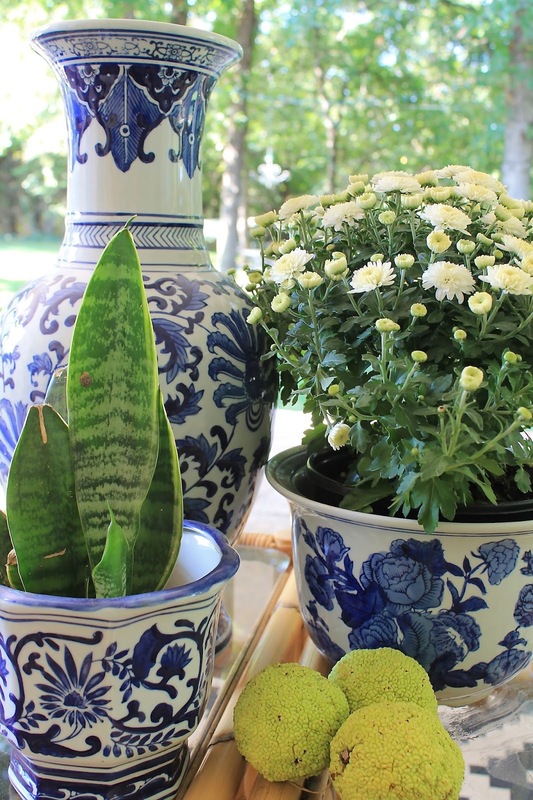 White pumpkins are sprinkled among the transferware. And here I tucked another little pumpkin on a cake stand. The family room got some white mums and burlap pumpkins. These are the only things I drug out of the attic this year. It has just been so blasted hot. As much as I profess to LOVE summer, I am ready for a tiny cool off and a date with fall. Shhhh, don't tell summer. The table is set with galvanized chargers and all white china. A sprig of rosemary smells fragrant tucked between the cutlery. 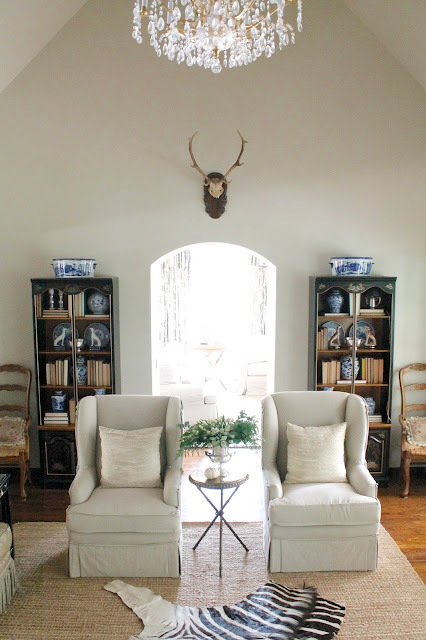 The formal living got a complete overhaul for fall. Our earlier plan to change out the marble and paint the woodwork got put on hold until next year. To see the before, go here. Okay, wow! Big difference, huh? Grasscloth lines the bookcases and all the accessories have been streamlined. Family photos are gathered together in coordinating silver frames. 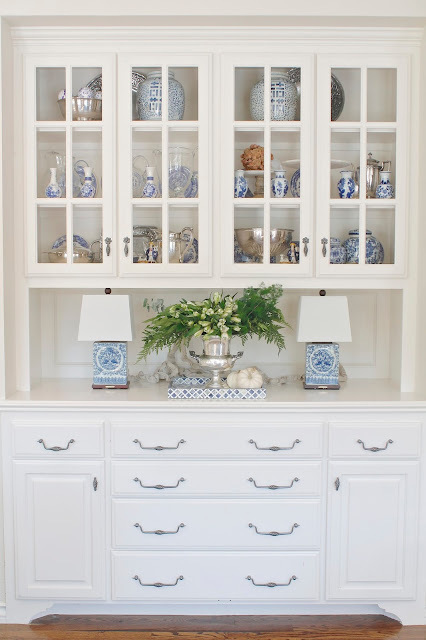 The chinoiserie bookcases have been filled with books, blue and white porcelains, and silver. The rug was changed to seagrass.. It completely lightened up this typically dark room. Someday, all this woodwork will be painted white... someday. 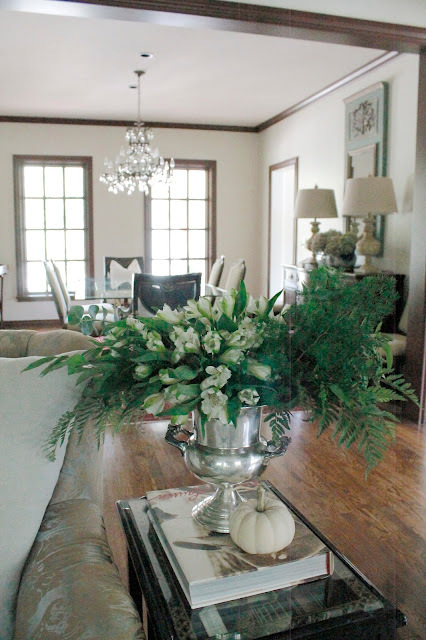 The coffee table floral centerpiece is my latest easy DIY. See how to make yourself a gorgeous, everlasting arrangement here. Waiting for after summer sales proved to be beneficial... I found the perfect lounge chairs and cafe set for this narrow area by the pool, all for a fraction of the price. Cozy throws in lieu of beach towels for star gazing at night (my boys' new favorite night time ritual). Last but not least, the porch is ready for fall as well. My bright, summery porch has been swapped for a more neutral tone and blankets are stacked for easy cuddling. Mums are plopped in porcelain planters ready to usher in fall. To see more of the Fall porch decor, visit HERE. "The Girls" are getting their fill of insects and grass while I am outside enjoying the glorious cooler temps and writing this post. I am so glad you stopped by today on the tour. Feel free to browse around Eleven Gables for a while, but please join us back on the tour tomorrow with an entire new set of homes! 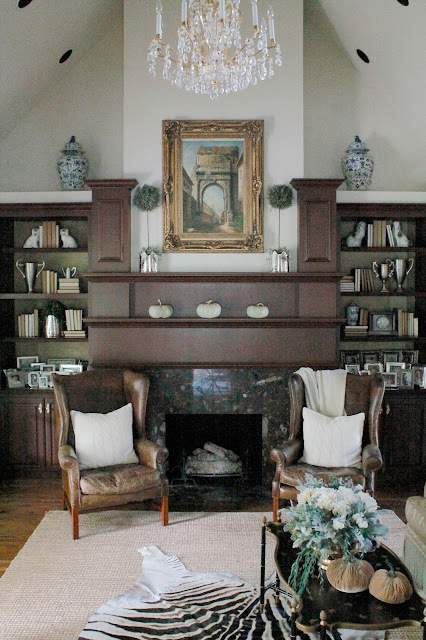 Thank you again, Lindsay, for including Eleven Gables among these gorgeous home tours. I would just adore for you to follow along with me on Instagram, Facebook, Twitter, Bloglovin', and email (see the box to subscribe on the right of your screen)!! Sign up to get my posts directly in your inbox!! Next up on the tour is a gorgeous tour from Chic Little House!!! Love it! Your house is an estate, and I want to vacation at your place. I'm obsessed with your fluffy girls too. beautiful. love your stacked pumpkins on the porch, and the branches from your maple tree in the kitchen makes it feel really rustic and homey! Beautiful!! 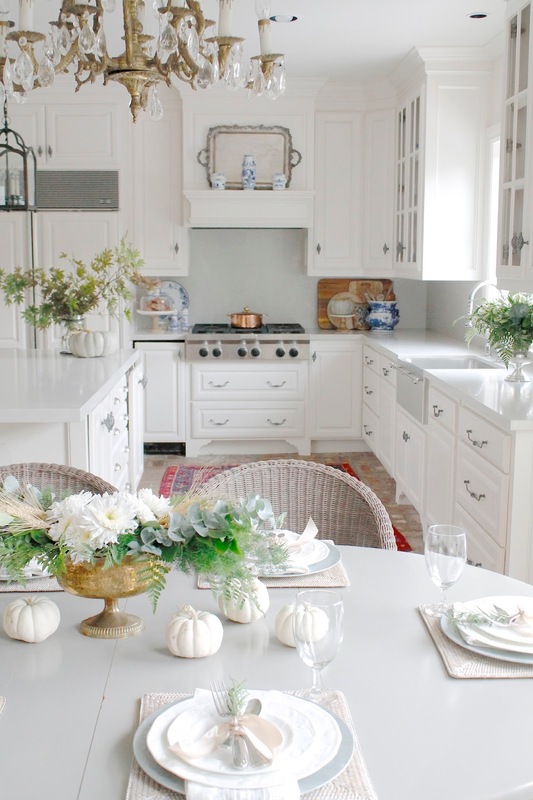 My favorite are the maple leaves and pumpkins on the kitchen island. You have a beautiful home! WOW, emily! your house nails it every time- it's stunning! i don't know my favorite part.... maybe the pumpkins in the urns! Emily your home is one of my favorites. It is so lovely in every way - how you've decorated it (love all the blue this year!) and the warm and welcoming feel of it. I love it!! And your sweet heart! You have the MOST beautiful home!!! 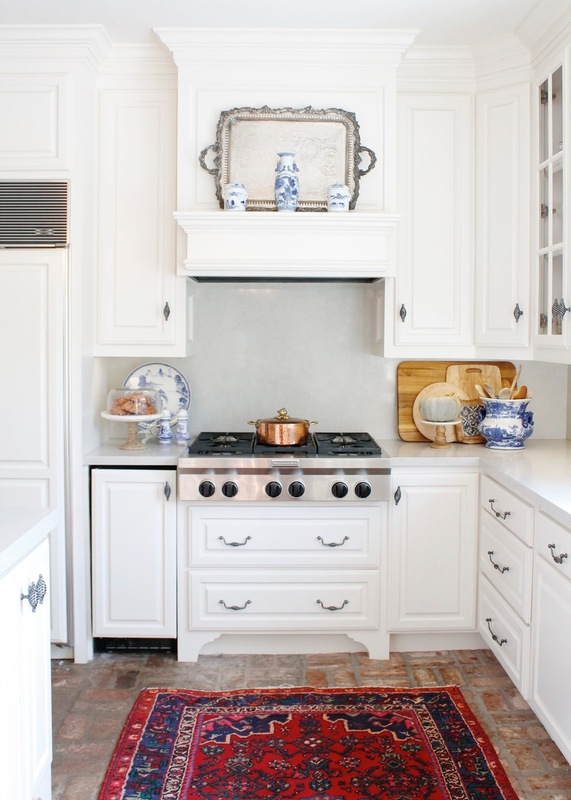 Your kitchen is a fave of mine - love that brick floor and vintage rug! Your home is beautiful no matter the season! I am excited to see the details about that arrangement too because anything "everlasting" is what I need! And I am stealing one of your chickens!! Beautiful! Your kitchen is just always stunning! Your porch. I never ever tire of seeing it. I could scroll through pictures of your home all day long. Simply gorgeous. It's absolutely stunning, sweet friend!!!! Absolutely Beautiful!! I kept scrolling up and down to make sure I didn't miss anything! Your house is so pretty and sophisticated but I love that it looks comfortable too. Just lovely. And I can never get enough Cinderella pumpkins! Just lovely! I have the same woodwork and would love to paint ours as well. What kind of paint will you be using? Are you going to strip yours first? I really would like to mark that chore off my list! I hope all is well... Haven feels like ages ago. xoxo, sweet friend! Stunning! Absolutely stunning! That kitchen just blows my mind. Bravo girl! Bravo! Your drapes!!!!! To die!!!!!!! Have happily followed your stunning style and stellar projects for years...... Would you, could you share drapery info--the toile family/sitting room drapes! They are perfection!!!!! Emily, as always your home looks stunning! You are definitely ready for fall. I love those white pumpkins as well. I haven't bought any yet this year but I filled my home with them last year. Enjoyed your lovely tour! GORGEOUS!!! I love the style of your flower arrangements and I swear white pumpkins are everything! Such a lovely home friend! P.S. I want those chicks! So Beautiful! I love everything. What a lovely tour of your home! Breathtaking views! What I always love about your home is how inviting it is to visitors. You strike the balance so well between making your home a decorator's dream and a haven for your family. Love that! You have welcomed fall so well into your home! I love how you decorate softly for fall at first. Such a good way of putting it. It just seems to abrupt to throw in all the heavy fall colors. Enjoyed the tour so much! Your house is so gorgeous, like straight out of a magazine! Love those adorable little fluffy chicks too! I love it! What kind of chickens are those fluffy little lovelies!? Your home is stunning!!! Your chinoiserie buffet at the entrance is spectacular and I just loved your kitchen. Your beautiful flower arrangements throughout are so pretty. And what are these animals you have? I can't tell...are they chickens? too cute! Thank you so much!! Yes, those are chickens :) Bantam Silkies. Gorgeous... every inch! I can't believe the difference in your formal living, it looks so much lighter and brighter just with how you've redone the accessories. Beautiful tour, Emily! Gah, it's all so beautiful! I love every nook and cranny! You have a beautiful home! Everything is gorgeous! You are so blessed to have all of that for your family. Absolutely stunning. Thanks for sharing! YOU are my new favorite home blogger. WOW.